Founders and entrepreneurs of early stage and emerging companies tend– as they should –to be very focused on their company growth….and crazy busy! The legal details?…..Not so much. Nowhere is this more evident in the area of properly organizing the capital structure of their (usually capital starved and hand to mouth) business. Every company should have a cap table that outlines what its structure “is” and that can be traced back to supporting documents that confirm this structure. A cap table is not a “legal” document (your share ownership registers and your share certificates, if you choose to have share certificates, play that role) but it is the most commonly used business tool investors refer to when they want to understand what your business ownership looks like. Cap tables typically include a “basic” presentation (ownership of shares only) with numbers and ownership percentages, and a “fully diluted” presentation (which takes into account all securities convertible, exercisable or exchangeable for shares). Cap tables also typically reflect “pre-money” and “post-money” ownership as they are commonly used in conjunction with the financing activities of early stage and emerging growth companies – by both the founders and investors – as they negotiate investment amounts, ownership entitlements, and the resulting valuation decisions those discussions result in. A new investor can see at a glance what the current ownership structure of the company looks like today (pre) and what it will look like tomorrow (post) after they make their investment. It is a jumping off point for an interested investor to conduct the financial and legal diligence on your business. Having a well organized cap table and supporting documentation that clearly and concisely shows and confirms the ownership interests you describe and related documentation supporting those interests provides investors with a level of confidence that you not only have a great business idea, but also understand the importance of managing the key aspects of your day to day business operations. It tells them you care about your investors. If for no reason other than this, founders need to be on top of their cap tables. The environment for companies is becoming more complex – with multiple funding rounds involving diverse groups of external investors, and a more complex set of equity, near-equity, and non-equity compensation tools used to motivate team performance. KISS/DIY – The “keep it simple” concept is the principle that definitely applies first and foremost. A clean cap table reflects a well organized, clear thinking team. And do it yourself, so you can think and learn as you do it. But don’t over complicate your cap table or turn it into a “what if” scenario modeling tool. Let your investors do that on their own time. Accuracy – Reflect the reality of your business in the here and now. Few things generate red flags faster than a cap table that doesn’t exist or doesn’t reflect your current actual business structure. If there are rights or claims on equity that are shown on the cap table but not documented, that is a big problem. An even larger one is rights or claims in collateral documentation (or worse, verbal agreements) that are not reflected on the cap table. Confidentiality – respect the value of the information and the privacy of your investors. Don’t feel obligated to provide granular information to prospective investors or others about your existing funders until you are well into the diligence process with them, and ensure that they are bound by confidentiality provisions with respect to the review and use of that information. Comprehensiveness –Simple doesn’t meet simplistic. Use appropriate notes to reflect rights or obligations that impact on your equity structure, now or in future. If you have an employee stock ownership plan, or a “phantom” plan that participates in the upside if there is an exit event, make sure those rights are noted. If you have convertible securities with “forward valuation” conversion features, incorporate illustrative conversion calculations, and make sure the assumptions underlying them are clear and correct. Aluvion’s Bay Street In A Box™ toolkit incorporates a number of useful tools, including a cap table, that will help you organize your business, successfully pursue your fundraising efforts, and attract and retain talent with a capital structure and incentive system that reflects your unique needs and protects your specific interests. 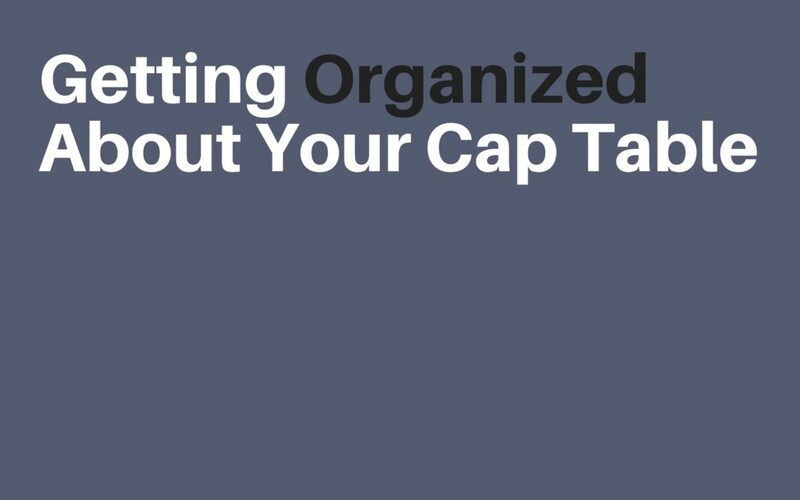 If you need help figuring out what your cap table should contain, or completing the documentation you need to make your cap table reflect your business reality, we’re happy to help.